Cities are full of booby traps lying around waiting to snap shut on the unwary motorcyclist. Collisions with other vehicles should be high on the danger list. Novice street riders may assume that motorcycling is basically a matter of skills such as balancing, shifting and throttle control. Experience soon teaches that avoiding crashes involves outsmarting as well as outmaneuvering other motorists. 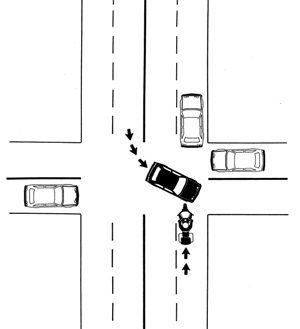 Left-turning vehicles at intersections are a frequent hazard for motorcyclists. Let's define intersection so we're all thinking about the same situations. An intersection is anywhere two traffic lanes connect, and that includes not only the obvious places where two streets cross, but also entrances to gas stations, alleys, driveways, traffic lanes in shopping malls and anywhere else two vehicles are likely to cross paths. 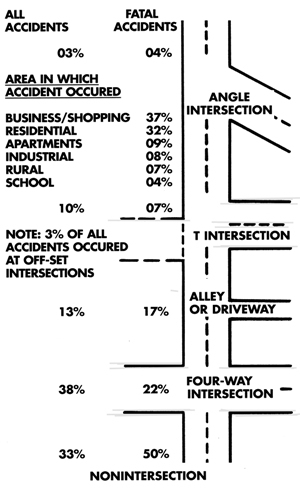 The diagram, based on the famous "Hurt Report," shows the relative percentages of accidents and fatalities that occurred at different types of intersections. The famous "Hurt Report" showed that a large percentage of crashes occurred at four-way intersections, but crashes occurring between intersections were more often fatal. An impressive 28% of car/motorcycle collisions in the Hurt Report occurred with the motorist making a left turn in front of the motorcycle. But let's also note that crashes occurring between intersections more often resulted in fatalities. And, while only 13% of crashes happened at alleys, alley collisions generated 17% of all motorcycle fatalities. Why would crashes away from intersections result in fatalities? It's likely that motorcyclists aren't prepared for mid-block crashes, and speeds are higher. Likewise, we tend to get complacent about alleys and driveways. Alleys are narrow and often hidden between buildings, so they are easy to ignore. You need to search aggressively for evidence of a vehicle about to pull out. Clues may be as subtle as a flicker of light reflected from a chrome bumper or the momentary glance of a pedestrian on the sidewalk. Streets, alleys and driveways on your right are more of a danger because vehicles emerging from them are closer to your path of travel. Moving farther away from alleys definitely improves your odds of avoiding a collision with a car that suddenly pulls out onto the street. 4-way intersections generate the majority of collisions, and account for 22% of fatalities, so let's consider how crashes occur at such locations. 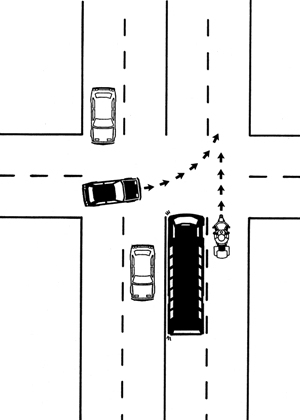 Typically, the driver turns left in front of the motorcyclist, and the bike slams into the side of the car. 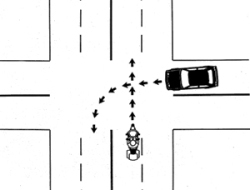 The typical left turn collision is with the oncoming driver turning across the path of the motorcycle. While most left-turn collisions are with a vehicle approaching from the opposite direction, there are several variations we need to watch for. 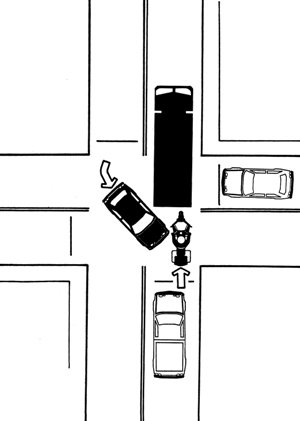 A driver can turn left from side streets either from your left, or from your right. When such vehicles are hidden behind busses, trucks, or parked cars, they can appear in your path suddenly. Large vehicles can really limit your view ahead, and also prevent other drivers from seeing you, so it's a good idea to stay well away from them. Be very wary of passing trucks or busses waiting to make a turn. The problem isn't just that you can't see what's happening ahead, it's that other drivers can't see you if you're hidden behind a truck or bus. The driver in the opposite lane who is waiting for a chance to turn left may think that space behind the bus would provide just enough room to zip across traffic. 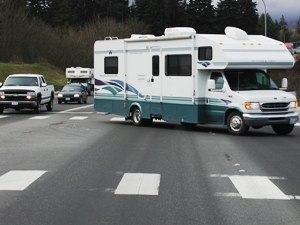 Wise riders don't follow immediately behind big obstructions such as long-haul trucks. It's usually a big surprise to both the motorcyclist and the left-turner when the driver suddenly swerves behind the truck and takes out the bike. Sure, you may have the legal right of way at intersections, but having the legal right of way is little consolation when you're looking up at the trauma doctor in the hospital. When you can't see what's going to happen in the next 12 seconds, slow down to give yourself time to react to the unknown, move to a lane position that maximizes your view, and be prepared to take evasive action to get out of the way. Be cautious about passing a large vehicle waiting to turn left. A car pulling out from the side street on your left can't see you. A driver can also make a left turn from a street on your right. Moving to the left lane will give you more time to react to such a situation. It's usually a big surprise to both the motorcyclist and the left-turner when the driver suddenly swerves behind the truck and takes out the bike. It's a good idea to scrutinize the road over which you will be traveling in the next 12 seconds. At a street speed of 40 mph, 12 seconds covers more than 700 feet! If you can't see that far ahead because of other traffic or obstructions, slowing down will give you more time to react to whatever suddenly pops into view. You should be especially wary of other vehicles that might be about to pull into your path. Some na�ve riders suggest establishing eye contact with the driver, but eye contact is no guarantee that he or she won't make the turn anyway. The driver could actually see you, but not comprehend you have the right of way. So, once you identify a vehicle that could turn in front of you, you need to know if it is actually starting to move into your path. When observing vehicles on side streets, watch the top of the front wheel. The top of the wheel moves twice as fast as the bumper, so the top of the tire starting to roll is your first clue that the vehicle is starting to move. Since around 1987, there has been a noticeable increase in the numbers of Sport Utility Vehicles (SUVs) and Light Trucks and Vans (LTVs) in the traffic mix. Today, LTVs account for over one third of registered passenger vehicles in the USA, and generally include the sub-category of SUVs. 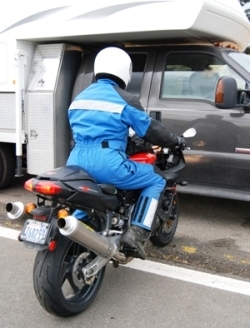 When collisions occur between LTVs and motorcycles, the weight and higher mass of the LTV is much more likely to result in serious injury to the rider. In a collision with another vehicle, the motorcyclist is typically thrown forward over the handlebars, and if it's a typical automobile, the rider is thrown over the top of the car. But in a collision with an LTV the rider is much more likely to body slam into the side. As it happens, the increase in the numbers of LTVs correlates to the increase in motorcycle fatalities in recent years. Even a mid-size 4-wheel drive SUV or pickup truck weighs in the neighborhood of 4,500 lbs, so colliding with one is like running into the proverbial brick wall. In a collision with a pickup truck, the motorcyclist isn't likely to fly over the top. So injuries are more severe than when colliding with a smaller passenger car. The lesson for motorcyclists is to be especially aware of LTVs in traffic. 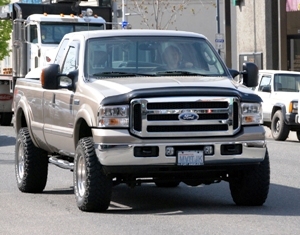 You should go on high alert when you are in proximity to any large, heavy vehicles in traffic. If you find yourself in a situation where there is any question over who should go first, yield to the LTV driver.